The report also shows a 23.9% decrease in average volume per client from the previous quarter, which is typical following the holiday email surge in late Q4, but shows an increase from Q1 2011 (21.4%). 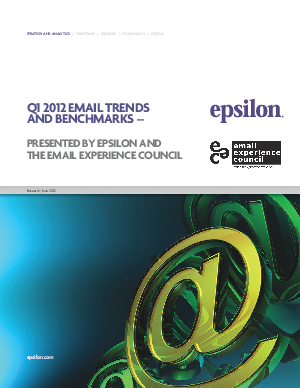 The quarterly analysis is compiled from 7.1 billion emails sent by Epsilon in January, February and March 2012, across multiple industries and approximately 150 participating clients. The analysis combines data from both of Epsilon's proprietary platforms, DREAM and DREAMmail.